Diamond TSolstice (Ibn Hisan x Diamond TSable) 2008 bay gelding. Delivered to his new home in Round Rock, TX, on March 15, 2011, TSol is progressing rapidly in his training. New owner, Catherine, and trainer, Connie, give frequent & enthusiastic reports on his accomplishments. Sol is destined to be a family pleasure, trail and possibly show horse. He already seems to love his work. A recent photo collage sent by Connie shows TSol cheerfully wearing a saddle, with "scary objects" tied to it, longeing at various gaits. A similar collage sent previously is labeled "teacher's pet." See more at: www.equitechstables.com. Al Shaamis Amira (Al Asham Amir x MS Raffelle) 2005 black mare. 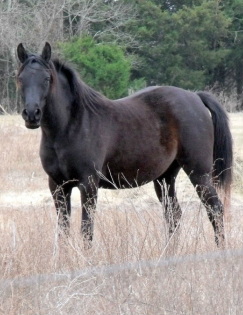 Mira was purchased to be a broodmare, & I never intended to sell her ... but ... she now has a wonderful new home in Arkansas, with Larry & family ... & is in saddle training & doing very well. Larry told me, after his first ride, "she has a home for life!" (Just what I love to hear!) A recent note reads: "Amira is doing just great. I have been riding her for about 3 weeks now and I just love her. Here is some pictures of her also. Thanks, Larry." May you have many wonderful years with your Diamond Magic Arabian!